Applications: Commercial vessels, pleasure vessels, buoys, pylons and sea chests. Applications: Lobster, crayfish and cray pots. Applications: Marine motors and pumps. These anodes can be machined down to a required diameter and can be threaded. Marine infrastructure protection. Temporary protection for pipelines prior to installation of long term CP installation. Applications: Marine engines, pumps, heat exchangers. An endless number of engine and pencil anodes are available, some common sizes listed below, other diameters/lengths/threads also available. 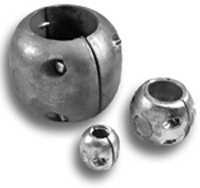 All shaft collar anodes are supplied with stainless steel screws. Applications: Tanks, Earthing Mats, Anchor Chains and temporary protection of pipelines prior to installation of long term CP installation. Applications: Marine commercial and pleasure vessels, ships hulls, rudders, buoys, ballast tanks, bow thruster tubes, heat exchangers, piers, pylons and sea chests. Applications: Large scale industry, infrastructure, tanker, wharf or other marine protection. For anode sizes outside of these dimensions, new moulds can be made. AMAC Cast onto a variety of insert types, depending on the method of attachment required. This illustration on the right identified the most common insert types. cleaning is conducted according to Australian or International standards. The following table represents a small proportion of the large block anodes we are able to manufacture. Applications: Marine and Subterranean pipelines and pylons. Manufacturing bracelet anodes for over 25 years allows us to meet almost any design requirements. The bracelet anodes below are the most common. Any combination of these elements, as well as anode length, thickness and weight can be incorporated to meet particular project requirements. If a project requires a uniquely designed bracelet anode, please contact our office. AMAC has a strict set of quality control mechanisms designed to ensure that each anode will function at its optimum for its entire design life. These controls ensure that steel grades and welding processes meet Australian and International Standards, alloy composition is accurate, insert fabrication meets dimensional specification, coating of internal surfaces and steel work is correct and all anodes meet weight and dimensional requirements. - Anode half bracelet pipe clamp, bolted together at site. Bolts designed so that half bracelets hinge around the pipe. anodes for special purpose applications.